Have a project and need a TV6? Get in touch for our good price! For those aboard yachts and merchant maritime vessels, reliable television service is much more than just a luxury: It’s a vital way to remain in touch with the outside world. Having access to television keeps crew members updated on world issues, sporting events, etc. It also provides valuable entertainment that can dramatically improve morale during long months at sea. Getting reliable satellite television reception at sea used to be challenging, but that’s no longer the case thanks to the groundbreaking TracVision TV-series from KVH. With its patented RingFire™ reception technology, the TracVision series offers a crystal-clear picture—anywhere you go. 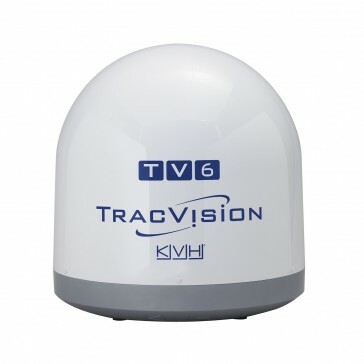 Additionally, each model of the TracVision TV-series (which includes the TV1, TV3, TV5, TV6, and TV8) offers unique features and options, allowing you to choose a model that suits your needs. • Multi-service support: The TracVision TV6 supports DIRECTV® U.S., DIRECTV Latin America, the DISH Network®, Bell TV, and circular and linear Ku-band services worldwide. • The TracVision TV-Hub: The TracVision TV-Hub is a stylish IP-enabled belowdecks unit that will complement even the most luxurious of vessels. Additionally, it boasts an easy-to-understand user interface, allowing crew members to view important system information on any Wifi-enabled device. • Peerless reception: The TracVision TV hub has been outfitted with KVH’s exclusive RingFire™ antenna technology. RingFire™ offers the strongest maritime satellite reception available, as well as the widest geographic coverage. • No delays: The TV6 includes highly advanced search technology known as the “advanced inertial-based stabilized search” system. This revolutionary search engine allows for lightning-fast satellite acquisition. • The best picture: Say goodbye to fuzzy, broken images and say hello to the TV6’s crystal-clear picture. The TracVision series comes equipped with high performance tracking with advanced algorithms that maintain picture clarity even in bad weather conditions. • Location-specific services: The TV6 features a Linear Universal Quad LNB configuration with built-in GPS and autoskew. There’s even a special Tri-Americas LNB option to ensure that your television experience remains flawlessly clear and reliable throughout the Americas. Check out the TracVision coverage map for a guide to where KVH provides satellite coverage. • No extra cords, no extra hassles: The TV6’s single coaxial cable takes care of all the unit’s needs—for power, data, and video. (The TV6’s 10-30 VDC input provides power to the TV-Hub, which then channels power to the antenna.) Not only does this allow for easy installation and handling, it facilitates simple retrofits as well. And of course, having just a single cable confers aesthetic benefits, too; luxurious yachts and cruise ships will no longer be marred by the appearance of numerous messy, twisted cables. • A world of programming at your fingertips: The TV6’s built-in worldwide satellite library will connect you with a wealth of entertainment options. Additionally, the TV6 has two output ports that are compatible with legacy receivers and therefore expand SWM capability for even more options. • Simple switching: The TV6’s IP AutoSwitch option for multiple receiver installations grants the ability to automatically switch between receivers on Dish Pro and DiSEqC-compatible services. • Peace of mind: All KVH TracVision units come with a world-class warranty (two years for parts plus one year for labor) and the promise of comprehensive customer support. You can receive support anywhere in the world thanks to KVH’s global Certified Support Network (CSN). If anything happens to your TV6, you can rest assured that KVH’s famous warranty coverage will have your satellite system up and running again in no time. Additionally, KVH builds their satellite systems to be as durable as possible. The TracVision TV6 can safely operate at temperatures between -25°C to +70°C (-13°F to +158°F) and it will withstand a range of weather conditions. • Freedom of choice: The TracVision TV6 can be enhanced with a diverse range of accessories. These include the DISH Network HD Wally receiver with RF Remote Control, the DIRECTV H25 HD Receiver with IR Remote Control (110 VAC), the DISH ViP 211Z Mobile Receiver with IR Remote Control, the DIRECTV Ethernet Coax Adapter (DECA) for automatic switching in multi-receiver applications, the RF Remote Control Kit for the DIRECTV H25 HD receiver, the KITPACK TV IP AUTOSWITCH, and more. 4. TracVision TV6 Satellite TV Antenna System with IP-enabled TV-Hub A plus Circular LNB with stacked Dual output for N. American Services (DIRECTV, DISH & BellTV). 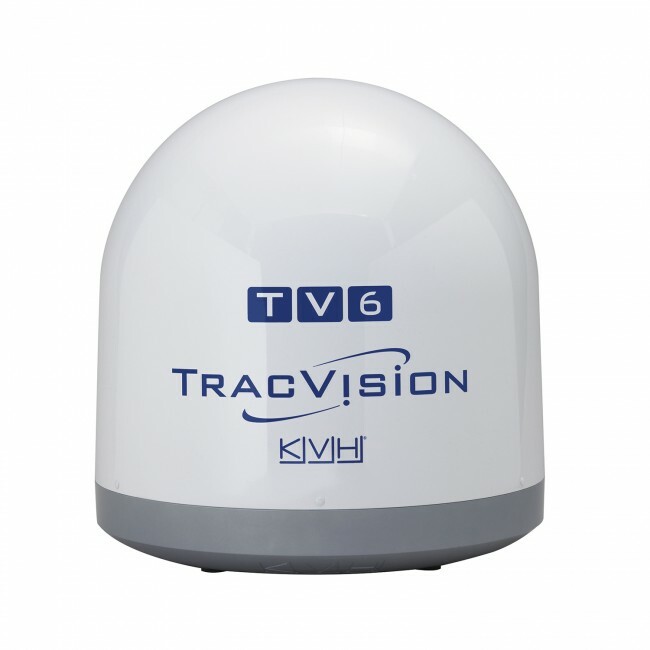 Why Choose A KVH TracVision Satellite System? KVH Industries, Inc., has been the leader in Marine Satellite TV technology for over 20 years, so when you choose a TracVision TV6 (or any other TracVision system), you know that quality is assured. KVH’s reputation as a premiere provider of in-motion satellite TV and communications systems has been cemented by the over 50,000 mobile satellite antennas it has designed, manufactured, and sold. KVH has provided units for maritime vessels, vehicles, and aircraft, all while winning multiple awards in the process: Numerous National Marine Electronics Association Industry Awards, the coveted General Motors Innovative Design Award, two CES Innovation Awards, the DAME Award in the Marine Electronics category, and more. KVH was even a finalist for the Automotive News PACE Award. From the company’s humble beginnings in Middletown, RI, USA, KVH has expanded around the world. They now boast multiple facilities in the US, Denmark, Norway, Singapore, and Japan. When it comes to marine satellite technology, there’s no other company that can rival KVH. 1. The reception is outstanding. Customers love that the TracVision TV6 has a clarity of signal so strong that the full detail of HDTV is preserved—no matter where they are at sea. Enjoy nature programs in stunning detail, never miss a word of the snappy dialogue on your favorite sitcoms, and pick up every nuance during dramas thanks to KVH’s exclusive RingFire signal technology. 2. You get the complete home theater experience while miles from home. One of the greatest joys of being far out at sea is having the time to kick back in the peace and quiet after the day’s activities are over… And what better way to relax than with a theater-quality movie night? In the past, the kind of satellite reception required to recreate a theater-grade viewing experience at sea simply didn’t exist, but all that has changed with the advent of KVH’s high-performance tracking. This new technology uses advanced algorithms to ensure a crystal clear picture, even in rough weather. The TracVision TV6 in particular boasts commercial-grade performance, perfectly solid satellite reception, and an extended coverage area that will roam as far as you do. 3. Big crews and big families love the versatility of the TracVision TV6. The TracVision TV6’s Integrated Single Wire Multiswitch (SWM-8) technology, which is built into the belowdecks TV-Hub, has been engineered to handle 8 DIRECTV receivers. And the best part? Setup is so easy that anyone can create a multiple-receiver arrangement, right out of the box! Never again will one family or crew member have to miss out on the big game because another wants to watch the news. Finally, everyone can enjoy their favorite programming, all from the same satellite. The only hassle involved in using a TracVision TV6 will be listening to your kids bargain for their own TV systems before your next voyage! Either way, you’ll never have to venture on shore again to keep your family or crew members entertained: With the TracVision TV6, you’ll have all the programming selection you need, right there in the marina. 4. The TracVision TV6 offers some of the best sound quality available in a marine satellite system. We live our lives to the sound of music. Whether we’re relaxing, studying, having a party, or working, we need an awesome soundtrack to set the mood. Fortunately, the TracVision TV6 can help make sure you never miss out on your beloved tunes while at sea. Enjoy an amazing selection of commercial free, CD-quality music channels that cross multiple genres—there’s truly something for everyone when you have the advantage of TracVision’s diverse satellite programming. From the perfect “chill out” music for a sunset cruise to the coolest ‘90s alternative rock for your boat party, the TracVision TV6 can provide what you need. 5. TracVision satellite systems can help to boost morale on long merchant voyages and encourage inter-crew bonding experiences. For those in the merchant marine industry, long weeks away from home and family can be rough. Life at sea can feel lonely, isolating, and tedious… Until you install a TracVision TV6. Suddenly, crew members can bond with one another over sporting events, connect with what’s going on back home via the news, and comfort themselves with quality entertainment at any time of the day or night. Why not try celebrating World TV Day (November 21st) with your new TracVision TV6? Grab some snacks, get your crew together, and enjoy a night at the movies. The enjoyment experienced when watching crystal-clear theater-quality television programming with new friends can create special memories that last a lifetime. Remember that morale is about more than just feeling good: Crews who are happier have been shown to be more productive and have fewer accidents on the job. Depression and isolation can deprive us of energy and lessen our focus, so it’s important to make sure that your crew has all of the resources they need to stay content at sea. Installing a TracVision satellite system can help to ensure that everyone on board your merchant marine vessel has the entertainment they need to lift their spirits and feel connected to the outside world. It’s a small investment to make—and the rewards are very much worth it. We’re confident that you will love the TracVision TV6 because we know that KVH TracVision products have been awarded the National Marine Electronics Association’s (NMEA) highest honors for 18 years in a row, in addition to receiving numerous other accolades. Since 1982, KVH has produced a greater number of in-motion satellite communications and TV antenna systems than any similar manufacturer of marine satellite products. That’s why you see more KVH brand satellite units in harbors around the world than any other type… Now that’s quality that speaks for itself. If you have any questions about the KVH TracVision TV6, feel free to get in touch with us. You can also check out the User Guide, Installation Guide (and Installation Instructions), and the Quick Start Guide provided on the KVH Website.